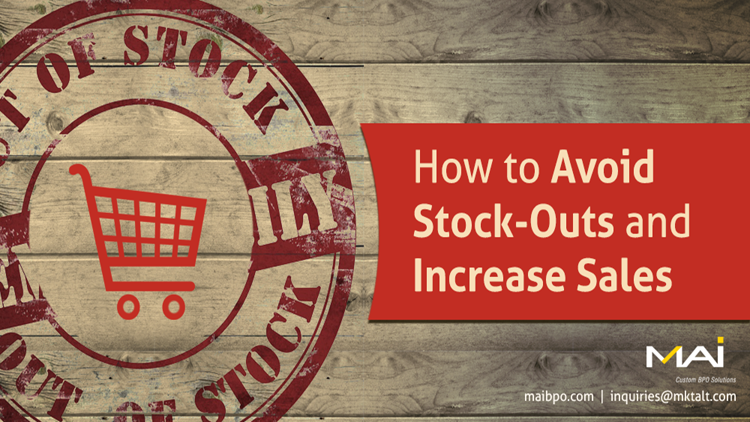 While the goal of most businesses is to sell the stock on hand in the fastest possible time, accomplishing this goal can ultimately lead to stock-outs at some point. A CNBC report estimates the total value of lost sales for retail businesses due to stock-out issues was $634.1 billion in 2015. And although retailers find stock-outs as annoying as their customers do, most live with gaps in inventory because they believe the fix is more expensive than the problem. Their logic is simple: when customers can’t find the product they want, they’ll simply substitute a similar item. Unfortunately, the damage stock-outs cause extends beyond lost sales. Aggressively wooing a customer and then failing to deliver the product amounts to a lot of effort and resources going to waste. Additionally, you end up earning annoyed customers who may never to return and are likely to spread bad word of mouth. In order to avoid stock-outs and their potentially unpleasant consequences, businesses require a highly functional supply chain along with a systematic approach to managing inventory. Inventory can include anything from raw materials to finished goods, from components needed to make a product to packaging items. As the adage goes, “for want of a nail, the kingdom was lost.” Unavailability of seemingly insignificant items can cause major disruption of sales. For example, if an essential component like screws to fix furniture is not available, it may lead to stock-out. Similarly, want of packing materials can cause disruption. A good inventory management system makes an estimate of all the materials and components required to make sales-ready products and make due provisions to maintain adequate stock levels. Automation is fast becoming indispensable for smooth operation. As the number of retailers and products are increasing, the highly stressed workforce finds it difficult to keep pace with the complexities. Automated inventory anticipates demand and prompts automatic re-orders when stock drops below a certain threshold. It makes an estimate of the delivery time, and triggers re-orders well in advance to make the entire process seamless and less chaotic. While the economics of demand and supply is (and always should be) a major consideration in deciding inventory levels, many businesses make the mistake of giving disproportionate weight to it, or worse, making it the sole consideration. Optimal inventory levels depend on several factors – predictability of demand, seasonal fluctuations in supply, any anticipated advertising blitz or promotional campaigns in the pipeline, the possibility of any external factor affecting supply chain, the reliability of the supply chain partners, and more. For instance, an anticipated shutdown in the geographical area from where a raw material is supplied can delay supplies and bring sales to a grinding halt. Even if the supply is reliable, it makes sense to purchase in bulk and get discounted rates and immunity from potential price hikes, rather than opt for just in time models. Effective inventory management is more than just storing the products. What also matters is the size, nature, if the inventory is fast moving, profitable, best practices for efficient and uninterrupted production, and the deployment of efficient techniques to balance demand-supply loop. Of all the different inventory models, such as fixed time reordering, just in time inventory, fixed order re-order, economic order quantity (EOQ), and others, there is no one-size that fits all. Effective inventory management requires the flexibility to adapt to the methods, or even combine methods, to best suit the specific circumstances. Effective forecasting and maintaining adequate buffers is a sound way to maintain optimal stock levels. Here, the use of big data analytics is invaluable in not just predicting demand, but also anticipating the replenishment time of new orders. A truly effective inventory management system goes beyond the management of in-stock inventory. It should also be able to offer several proactive services, such as stock alerts when a product is nearly out-of-stock, alert when back-in-stock, internal back order management and adjustments, shipment notification to key stakeholders, and more. The best inventory feeds offer comprehensive and in-depth real-time information to the stakeholders, including information such as available inventory by location, re-stock dates for low or out-of-stock units, the real-time position of inventory in transit, and more. Such notifications and proactive services envision stock out issues and permit managers to remain in control over stock and the supply chain. Inventory being a critical component of the business process requires effective real time monitoring, to resolve glitches as it emerges. Staying organized and vigilant, and keeping a proactive and live relationship with channel partners such as suppliers is the name of the game for success. Sound technologies, such as timely alerts through mobile, Radio Frequency Identification (RFID) or sensors for effective tracking, and more, are key enablers of the process. These days, most companies are adopting lean inventory management as they contribute well to the bottom line. The benefits include reduced stock keeping units (SKU) and inventory levels, increased use of standards in processes and materials, improved collaborations and a general reduction in cost of goods sold. How would you rate your inventory management?